Zak Konstantino, Steve Konstantino and Ben McCrave outside the Performance Building Supply Showroom. STEVE KONSTANTINO, the 55-year-old founder and owner of Portland-based Performance Building Supply, considers himself a bit of a futurist technologies geek. Being ahead of the curve occasionally means he’s moved on to something else before the market catches onto what he’s selling—as was the case with heat pumps in the early 2000s. More often, he finds himself busy with consulting and educating despite his business being sales-focused. But, always, his recommendations can be counted on to be practical, high- performing and the right thing for the project. A cross-section of triple-paned windows available through Performance Building Supply. High-performance construction is nothing new to Konstantino, whose in-laws had an energy-saving geothermal passive solar convective envelope house in Brunswick built in the 1970s. “Both of the houses my wife, Valerie, and I built were modifications of that design,” Konstantino says, explaining that they had a greenhouse on the south side and a modified envelope through which warm air would come into the second-floor bedroom. When they moved back to Maine, they rented a place while building another high-performance house, and their son’s asthma temporarily returned. By then, Steve Konstantino was a firm believer not only in energy-efficient, durable, green construction but balancing those ideals with comfort and health. But it wasn’t always easy to find the materials he wanted or needed to achieve this aim. “While I was building the house up here, I realized it was harder to get greener building products as well as high-performing products,” Konstantino says. It was that discovery that led him to found Maine Green Building Supply in 2002 to make it easier for like-minded developers, architects, contractors and homeowners to learn about and purchase what can often be hard-to-find products. A selection of Executive Cabinets, the only all-wood cabinet that is GREENGUARD gold certified. In the years since, Konstantino has established himself as a trusted advisor among his peers, always helping the industry to grow and evolve. In 2009, he collaborated with another environmentally-minded builder, Dan Kolbert of Kolbert Building, to launch a monthly building science discussion group for building professionals. Anywhere from 15 to 60 people show up each month to discuss topics ranging from insulation and air sealing technologies to how to get high-performance homes to appraise well. One example is the super-insulated windows Konstantino imports from Europe because, in his opinion, they are the best windows on the market. “He first started selling them locally, and now sells up and down the East Coast,” Kolbert says. Performance Building Supply carries a mix of environmentally friendly building products, including professional grade wood floor finishes. Konstantino is involved in the Passive House movement and believes there’s a lot to learn from it, even if you don’t build a Passive House. True Passive House construction (which is different from the passive solar homes he built in the past) reduces the required energy use in a building by about 90 percent. 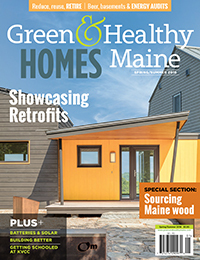 Maine has 40 to 50 single-family homes, a couple multi- family units and four schools—including Friends School of Portland—built to Passive House standards. Naomi Beal, executive director of the nonprofit passivhausMAINE, says that Konstantino has consulted on or sold products to many of those projects. Located in Portland’s Bayside neighborhood off Marginal Way, the Performance Building Supply showroom displays an eclectic mix of products, including tapes and membranes for weather barriers as well as professional-grade wood floor finishes that don’t off-gas. Steve Konstantino at the monthly building science discussion group hosted at Performance Building Supply. “If you’re building this uber-tight home that’s so energy efficient you can practically heat it with a lightbulb, of course you’re concerned with what you bring in the door,” says kitchen designer Catherine Weiland of Balance Design Studio, which joined forces with Performance Building Supply in 2014. Performance Building Supply already carried Executive Cabinets—the only all-wood cabinet that is GREENGUARD gold certified—and partnering with an environmentally-minded kitchen designer made sense. For him, choosing to build high performance is a no-brainer. Konstantino compares a high-performing house to an electric car—it’s not only better for the environment but just better. Better, in Konstantino’s eyes, means healthier and more efficient—and efficiency is better for the environment. Through the building science discussion group, he’s bringing together builders, architects, real estate agents and even DIY-ers to consider alternative methods and products—even when the products are sold by his competitors.